Chestnut blight is a plant disease caused by the ascomycete fungus Cryphonectria parasitica. This pathogen has caused severe epidemics resulting in death and dieback of American sweet chestnut (Castanea dentata) in North America and European sweet chestnut (C. sativa) in continental Europe after its identification in North America in the early 20th century and Europe in the 1930s. It was first identified in Europe, in Italy, in 1938. C. parasitica infection is usually fatal to European and North American sweet chestnut trees. It devastated sweet chestnut forests in the eastern USA during the first half of the 20th century, killing an estimated 3.5 billion trees after it was accidentally introduced there from Asia. Although losses have not been on the same scale in Europe, it has spread steadily throughout much of Europe, and tree losses have been regionally significant. Sweet chestnuts are grown commercially in Europe and the UK for the nut market, so in addition to the environmental and biodiversity impact, it can have an economic impact. Chestnut blight is not known to be currently present in the UK. However, C. parasitica was identified in November 2011 as the cause of dieback in European sweet chestnut in Warwickshire, central England. Approximately 300 trees had been planted for nut production in 2007, and infection become apparent in about half of the plants. A second outbreak was later found on a smaller site containing about 30 trees on a site in East Sussex which had been planted for nut production with trees from the same source as the Warwickshire trees. A following trace-forward exercise identified that a small number of infected trees were delivered to seven other locations in England. It had never previously been found in Britain, although it has been present in southern continental Europe since the 1930s, and can now be found in much of the continent. All symptoms on infected trees occur above the ground. C. parasitica attacks the bark of European sweet chestnut and enters through fissures or wounds. 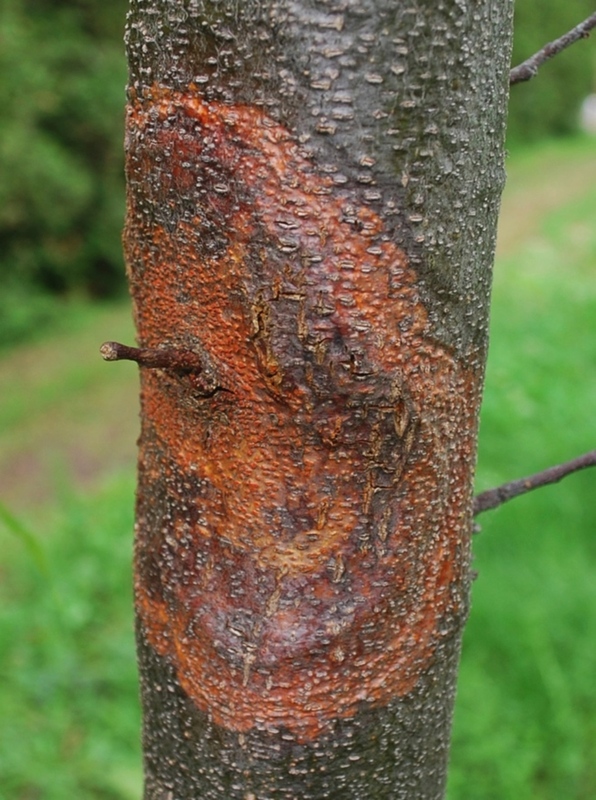 On grafted trees, infections are most frequently found in the region of the graft, where callusing occurs. In coppices or orchards, infections are often located at the base of the stem (collars or insertion points), although bark death does not spread into the root system. The fungus can spread with such rapidity in infected bark that stems or branches are soon girdled and the dead bark becomes visible as a sunken canker. Above the girdling canker, leaves wilt and turn brown, but remain hanging on the tree. Below the canker, branches have healthy foliage and, after a short time, new shoots are produced below the area of dead bark. It is common to find many cankers on a single tree. On young, smooth-barked branches the cankered bark can be a bright brown, in contrast to the greenish colour of normal bark. On older stem infections, the discoloration or sunken nature of the infected bark is much less obvious. When the bark is killed rapidly the stem is girdled without any callus formation. However, sometimes the disease’s progress is slower, and new layers of bark form under the affected areas so that swelling and subsequent cracking of the outer bark occurs. Masses of yellow-orange to reddish-brown pustules, the size of a pin-head, develop on infected bark. These fruit bodies erupt through lenticels and exude long, orange-yellow tendrils of spores in moist weather. Another characteristic symptom is the formation of pale-brown mycelial fans in the inner bark, although these can only be revealed by cutting away the outer bark. Some of the symptoms caused by C. parasitica, such as crown dieback, can be confused with other diseases caused by other pathogens, including Phytophthora species, e.g. Phytophthora cinnamomi or P. cambivora (commonly associated with ‘ink disease’, named after a blue-black stain found around damaged roots). These pathogens are already present on a range of host plants in the UK, and have been known for many decades to cause disease on sweet chestnut. Other diseases that cause dieback and cankers on sweet chestnut are forms of Amphiporthe castanea (formerly Cryptodiaporthe castanea), Diplodina castaneae and Ramorum disease (Phytophthora ramorum). We served notice on the owners of the affected trees to uproot all sweet chestnut plants and burn them on the affected sites. Surveys of a 3-kilometre radius around the infected sites and into surrounding woodland were carried out to determine the extent of any symptomatic chestnut. No further evidence of infection was found. Fera (now Apha) was fully involved in the investigation and represented on the disease outbreak management team. It contacted other recipients of plants for planting from the same source, as well as liaising with the European Commission and the French authorities. The findings were used to inform decisions about where we carry out our annual survey of sweet chestnut for the UK’s Protected Zone status. We have strengthened the EU protection in response to these findings, including a requirement that plants must originate from pest-free areas (areas free of C. parasitica). Information from the outbreak and from woodland surveys were used to update and publish our contingency plan for new disease outbreaks. Pest Risk Assessment (Fera) – measures to protect the UK from further entry. C. parasitica is treated as a European Union (EU) quarantine organism, which means that movements of planting material must be free from it, with plant passports issued to provide an assurance of compliance with requirements and to ensure traceability of the material. A small umber of European countries, including the United Kingdom, are also Protected Zones for C. parasitica, listed in the EU’s Plant Health Directive. Movements into such zones require compliance with additional requirements, accompanied by specific plant passports eligible for the zones in question. In the case of C. parasitica, movement of plants intended for planting (including seed), and round timber and isolated bark, into countries with protected-zone status is not permitted unless the plants, timber or bark have been passported and are accompanied by an official statement to show that they either originate in a pest-free area, or (in the case of timber and bark) it has been kiln dried, or that the bark has been fumigated. Requirements for statutory pre-notification of imports of Castanea (Sweet chestnut), as well as Plane (Platanus), Oak (Quercus), and Ash (Fraxinus), came into effect on 17 January 2013. C. parasitica is a serious pathogen mainly of American and European sweet chestnuts, although the latter might be slightly less susceptible than the American chestnut. The main types at risk in the UK are European sweet chestnut, which is grown for nut production, and introduced plantings of American sweet chestnut. The familiar horse chestnut ‘conker tree’ is unrelated to Castanea and is not affected, and nor is chestnut oak (Quercus prinus). Other oak species can be infected, including Britain’s native sessile and, less often, pedunculate oaks (Quercus petraea and Q. robur), as well as Holm oak (Q. ilex) and others. However, the cankers tend to be superficial infections of the bark which rarely cause the death of branches, sprouts or whole trees. The European Plant Protection Organisation (EPPO) also lists Castanopsis, Acer, Rhus typhina and Carya ovata as host species. It originated in eastern Asia, where the disease occurs on indigenous Castanea species, causing little damage. Asian chestnuts have adapted and become tolerant to infection as a result of their long co-evolution with C. parasitica. The susceptibility of American chestnut soon became apparent after the first discovery of chestnut blight in New York in 1904. Within 40-50 years the disease had spread over the entire native range of the chestnut, from Maine in the north to Georgia in the south, and west to Ohio and Tennessee, devastating much of the estimated 4 billion American chestnut population. The first record of the disease in Europe was made in Italy in 1938. It is now widespread in Europe, with the exception of some countries with EU Protected Zone (PZ) status. Annual PZ surveys have been carried out in sweet chestnut woodland in Britain since 1993 without the disease being detected. Some European countries and regions remain free of the disease, including the Czech Republic, Ireland, Sweden and the Greek islands of Crete and Lesvos. These countries (other than Greece) have EU Protected Zone status for the pathogen. European countries and regions where it has been confirmed. At present it is not possible to confirm how the pathogen entered the UK. It has the potential to be moved on infected timber and on infected plants for planting. The outbreak sites in England were planted with material supplied from the same nursery in France, although the source of the infection might never be proven. Long-distance spread occurs through international trade, with infected plants, wood or bark acting as pathways. Once bark has been colonised, the mycelium of the pathogen is reported to survive in this tissue for up to 10 months, even if it has been air dried. There is also a small risk of transmission by fruits or seeds.